While their Ford Racing teammate Marcos Ambrose celebrated in victory lane, the Roushketeers walked away with top 15 finishes at Watkins Glen, a pretty successful day overall. With just four races remaining until the Chase field is set, Carl Edwards chances of making the roster grow slimmer each week. 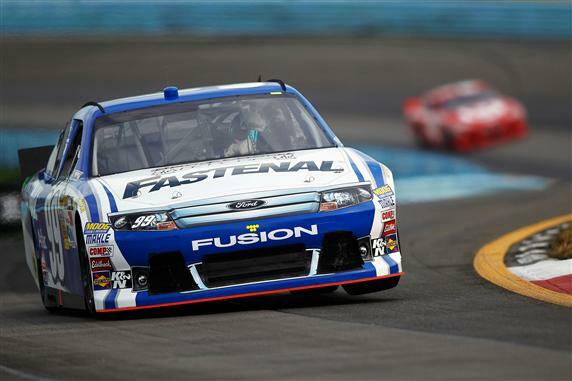 Edwards did manage a win this weekend in his return to the Nationwide Series. The trip to victory lane delighted Edheads while ruffling the feathers of some competitors who cited his driving as aggressive. Teammates Greg Biffle and Matt Kenseth are just two points behind new points leader Jimmie Johnson and well on their way to bringing home a championship. Greg Biffle and crew chief Matt Puccia had the two pit stop strategy and stuck to the plan, making it work despite handling issues. Running in or near the top 10 all afternoon, Biffle was in fourth in the final laps when he slid in the oil laid down by Bobby Labonte. Loosing a bit of track position, The Biff finished in sixth. Starting the day in 24th, Matt Kenseth gained those positions at a feverish pace. Moving into the top 20 on the opening lap, Kenseth complained that the No. 17 EcoBoost was "out of control loose" and that would be an issue throughout the day. Crew chief Jimmy Fennig went to work, trying to get the handling to Kenseth's liking. In the closing laps, Kenseth's spotter Mike Calinoff said "U GOT IT!" Finishing the race in eighth, Kenseth tied his career best finish at The Glen. Kenseth is now third in point, just two markers behind Jimmie Johnson. Finally Carl Edwards got to victory lane...in the Nationwide Series but hey, it was a win! To the delight of the Edheads everywhere, Edwards pulled off his trademark backflip and the judges give him a 9.9 for the landing. Looking to sweep The Glen, Edwards and crew chief Chad Norris had a good car all weekend. Running strong in practices, Edwards qualified in 18th and would work his way into the top 10 by lap 16. In sixth as the field started to cycle in for pit stops at Lap 40, Edwards jumped to fourth and was called to pit road by Norris. The caution came out and stuck them out an additional lap which was a costly one, the No. 99 Fastenal Ford Fusion ran out of fuel and had problems refiring on pit road. After restarting in 20th, Edwards was able to move up to 14th in the closing laps but the finish was in no way reflective of their day. Still sitting outside of the Chase and needing a win to hope for the Wild Card, time is running out with just four races to go.